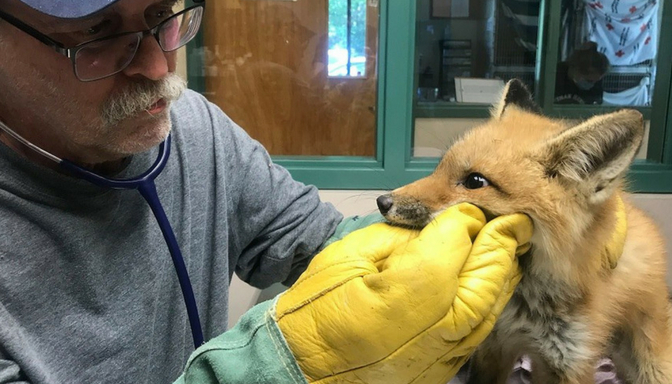 Two dehydrated four-month-old red fox kits arrived at New England Wildlife Center’s (NEWC) wildlife hospital on Thursday from Hingham, MA after concerned homeowners alerted town officials. The kits were rescued from the bottom of a well by a Department of Public Works employee and firefighters, and brought to NEWC by Hingham Animal Control Officer Leslie Badger. The other fox siblings did not survive. Dr. Greg Mertz, NEWC’s CEO, performed a physical exam with Dr. Carina Ziegler, interning veterinarian from Romania. During the exam, all organ systems appeared healthy and within normal limits. The fox kits will be given fluids and supportive care. Further diagnostics will be performed if necessary. The whereabouts of the kits’ mom is unknown. According to Dr. Mertz, it’s unlikely she left her babies voluntarily. We will continue to provide updates on the fox kits’ status as more information becomes available. Thank you to the homeowners who let officials know about the fox kits, to the Hingham DPW employee and firefighters who climbed down to rescue the kits, and to Hingham ACO Leslie Badger, a dear friend of wildlife, for bringing them to NEWC for emergency care. This is a critical time of year for wildlife. This summer, NEWC has double the number animals in need of veterinary care! Our wildlife veterinary team is trying to care for wild animals here, and now, on Cape Cod. Right now the Center is struggling to keep prying the doors open at the Cape Wildlife Center this summer. We need your help to continue to provide life-saving support to wildlife like these baby fox kits, today and everyday. Please click here to donate now – every dollar, any amount makes a difference for wildlife!